I believe in golf for everybody not just the wealthy. Golf is a game to bring people together, a recreation for the community, a place to gather in the outdoors, a place to teach kids virtues and ethics that will translate in any social setting and become a positive factor in right human relations on a larger scale around the planet. So saving a local muni in our very own backyard has become a focus of energy not just for me and my company Linksoul but for the entire Oceanside community. Previously known as 'Center City Golf Course' was originally built as a 9 hole par 36 in 1952. It was later redesigned in the 80's as an 18 hole short course of par 66 and 5,000 yards long. The locals have know it as Goat Hill since that time. This city owned land was leased to Lud Kuenig and he was a great steward of junior golf and community golf. Unfortunately Lud died in 2006. Since that time a series of unfortunate events had left the course in horrible shape and in a state of disrepair. The city of Oceanside had put an RFP out on the site which had attracted several big time developers licking their chops at the location and to bury it in concrete that would forevermore lose this beautiful patch of green for the community to recreate. Lead by the Linksoul Company and a group of like minded locals we put in our own proposal to clean up the site and make it better than ever and a place of civic pride. We've now been running the place for a year and with love, some $, new vision, better agronomy practices the place is starting to shape up. Our goal is sustainability and to offer an affordable option to play golf and a safe haven for kids. Our motto is 'WORKING CLASS + WORLD CLASS' And oh by the way we have embraced what the locals have always referred to the place and officially changed the name to GOAT HILL PARK. Although we've come a long way we still have a long way to go. We have been hit with unanticipated costs to improve our mainline pipe and our irrigation system, among other things. But the good news is that once we make this improvement we will be able to tap into a reclaim water source and in turn become both social and environmental stewards of the game. The other part of my hike is still related to Goat Hill Park. It is to raise some money to start our Caddie Academy and Leadership program that is based on the Solich Caddie Academy and Leadership Program in Denver CO at his course called Common Ground. This to me is a game changer and what's missing right now in the game of golf. Teaching a kid to be an excellent caddie is more important than teaching them to be a good golfer. Please support me in my 100 hole hike!!! Act now too btw, as usual I've waited till the last minute and I need your help!! 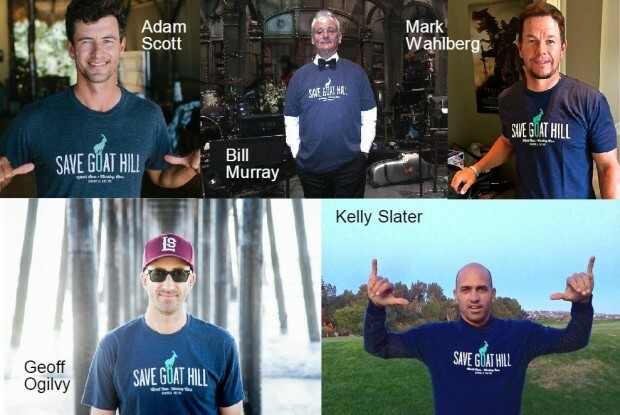 The same contribution gifts that are in our 'Save Goat Hill' Indiegogo campaign are available for my hundred hole hike. PLEASE SEND TO YOUR FRIENDS AND FAMILY TOO!! !